USA Roller Chain and Sprockets is a premier supplier of high-quality industrial duty roller chain and roller chain accessories. Ranging from ANSI to ISO and DIN spaced roller chains we have the largest selection in the world. Additionally, made to order (MTO) chains and roller chain accessories can be supplied upon request. Accessories can range from roller chain links through to maintenance tools like breakers and gauges. The most common roller chain accessory is a roller chain breaker. We offer several different styles of breakers from the USA and Europe. For users who are unfamiliar with how a roller chain breaker works check out our How To Cut Roller Chain page for a step-by-step breakdown of the process. Roller Chain pullers are an accessory used for taking tension off of the chain to add links or break the chain. Our pullers are manufactured to be extremely durable and long-lasting. We also have a Made in USA cable operated puller for ANSI chain sizes 80 - 240 and metric sizes 16B - 48B. Perhaps one of the most intuitive chain tools we have is the roller chain wear gauge. Currently, it is only available for ANSI 35 - 240 chain sizes but more sizes will be available soon. Its ease of use and maintenance benefits have made this tool a must for most large facilities. Connecting links, also commonly referred to as master links. Are used to connect two ends of the chain together or for making repairs, they are technically a pin-link (outer link) so in circumstances where a chain outside link breaks a connecting link can be used. An offset link is also commonly known as a half-link because of the offset-drive design it represents half a pitch. These links are used for general adjustments on the chain. A roller link is simply the inner link of a roller chain. It will include two bushings, two rollers, and two inner side plates. These links are used for repairs or chain edits. At USA Roller Chain we understand the importance of properly maintaining your chain so you get the best life and performance out of your chain. Because of this, we have the largest roller chain maintenance accessory options in the world. Check out our Roller Chain Maintenance page for information on maintaining your chain! Our maintenance kit includes the essentials for anyone looking to properly maintain their chain. 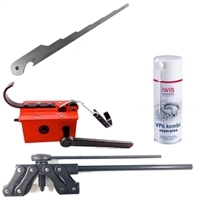 Keeping a roller chain repair kit is one of the best and easiest ways of reducing downtime. They include connecting links, offset links and roller links for making quick repairs while waiting for the new chain to come in. Roller Chain Lubrication is one of the most essential properties of properly maintaining a chain. We stock complete automatic lubricating systems as well as spray-on cans for applications that are less comprehensive. Using a roller chain tensioner is almost essential in every chain driven application. It keeps the proper amount of tension on the chain to prevent premature wear and lack of performance. Using a roller chain guide is recommended in applications where the chain is riding on metal or is going to be suspended for long long lengths. Using a chain guide drastically increases the wear life of a chain.